Library book sales are held several times a year. If it rains on the day of a sale, the sale will be canceled and held on the next scheduled date. Please note that the library parking lot will be closed during book sales. We welcome donations, not only of books but CDs and DVDs in good condition (no magazines, please). Items may be taken to the library on Tuesdays or Thursdays between 12:30 - 5:00 p.m. If you would be interested in volunteering to receive donated items in the library on one Tuesday or Thursday a month between 12:30 - 3:00 p.m. or 3:00 - 5:00 p.m. please call (310) 962-8313. 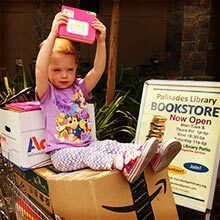 Friends of the Palisades Library are very excited to announce that the Palisades Library Bookstore is open for business! The Bookstore is located on the small patio adjacent to the magazine section in the rear right of the library. In addition to selling gently used hardbacks and paperbacks in fiction, nonfiction and children's categories, the store features a modest inventory of DVD's, music and books on CD and ‘Special’ books. Inventory is added to the store on an ongoing basis. Parking lot Book Sales will continue as usual. Proceeds from the Bookstore will be donated to the Branch Library to help purchase books, books on CD, research material and many other items that our branch would not otherwise be able to offer. 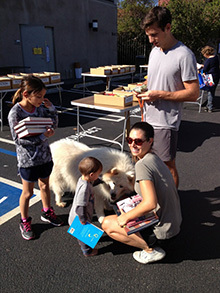 Money raised from the regular parking lot Book Sales also benefits the Branch.